Every once in awhile a book comes along that I think really makes God smile. Upside-Down Prayers for Parents is definitely one of those books. Parenting devos are nothing new, but Lisa T. Bergren's approach is fresh and totally unexpected. In fact, like the title says, these prayers are genuinely upside-down from the kind of things we typically pray for our kids. Praying for kids to fail, weep and grow weary is not exactly the stuff of your typical happy parenting book, but they are the kinds of prayers that make all of us more like Jesus. Just check out some of the titles to see why I think this book makes God smile. Day 2 I pray you'll fail in things that don't matter - and learn to seek God in what matters most. Day 9 I pray you'll experience unanswered prayers - and develop deeper, wider trust. Day 22 I pray you'll face financial hardship - and see how God is after something bigger than food and shelter. Yeah, I know. No warm fuzzies here. But like Lisa says, these are the kinds of prayers that actually lead to spiritual growth, the greatest hope we can ever have for our kids. As a dad working through these prayers, I can tell you that sometimes they are downright painful to pray for my own kids and just as painful to pray for myself. But this is the kind of parenting, and the kind of prayers, that will prepare our kids to face anything, and come out stronger and closer to God. Thanks, Lisa, for stretching me as a dad to care about bigger things for my girls and for myself. Thanks for reflecting the heart of God! 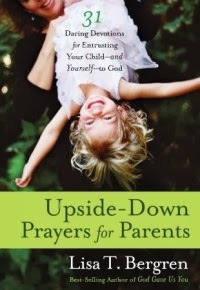 You can find Upside-Down Prayers for Parents on Amazon, and you can check out more from Lisa T. Bergren on her website.